My mom has made this simple recipe during the holidays for as long as I can remember. I don’t think we’ve ever had a holiday dinner when she didn’t make it. It only has three main ingredients in addition to some spices. 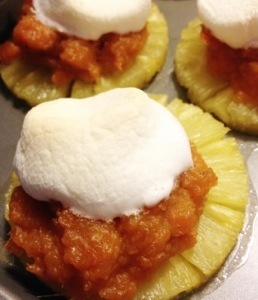 I don’t even know what to call it as we’ve always just called it that yam and pineapple thing with the marshmallow on top. Apparently my grandmother used to make it during the holidays too. This year I tried to make it into a casserole but that just did not work out so I’m sticking with my mom’s tried and true recipe. I can’t even begin to tell you how something so simple can taste so delicious. To me it screams Thanksgiving or Christmas but I could have it any time of the year. In fact, excuse me while I go make some more right now. Drain the yams, reserving 1 tablespoon of the juice. Add the yams to a saucepan and heat under medium heat. Add butter and let melt. Add sugar and cinnamon and mix together. Once mixture is heated completely, turn off heat. Place pineapple rings on a Cooke sheet. Add yam mixture to top of pineapples. Place a marshmallow on top of yam mixture. Place cookie sheet in oven for about 15 minutes or until marshmallows get brown.